Sometimes talking about Jesus with your friends can feel like trying to close a deal on a sales call, pushing something on people they may not really want. But what if you thought of it more like inviting them on a spiritual journey? Imagine being free to be yourself and free for the Spirit to work in you. Imagine that it doesn't depend on you alone but that you can be an important part of a witnessing community. Imagine telling people stories instead of trying to download content. Here is your invitation to reimagine what evangelism could be for you. "As a businessman who strives to integrate faith at work, I struggle daily to be active in sharing my faith. 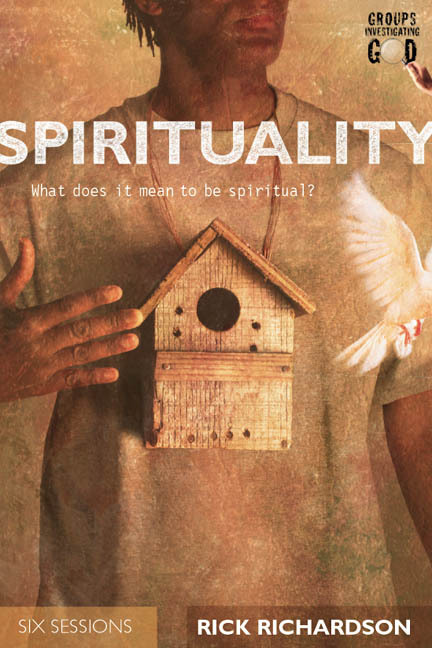 The message of this book has given me new hope and excitement to invite friends on a spiritual journey." "Reimagining Evangelism is unnervingly good and dangerous. Good because it causes you to reimagine what it means to share Jesus with others on a spiritual journey. Dangerous because it leads you into transformational encounters." "Reimagining Evangelism provides a powerful paradigm shift in evangelism, refreshingly relevant and practical for today's culture. Just imagine engaging in spiritual conversations in such a way that people actually look forward to the adventure with anticipation and intrigue. Rick Richardson shows us how to make that happen! He's done a terrific job of empowering ordinary Christians to reach ordinary people with God's extraordinary message of forgiveness and life change." "Reimagining Evangelism is a book that every Christ-follower should read! 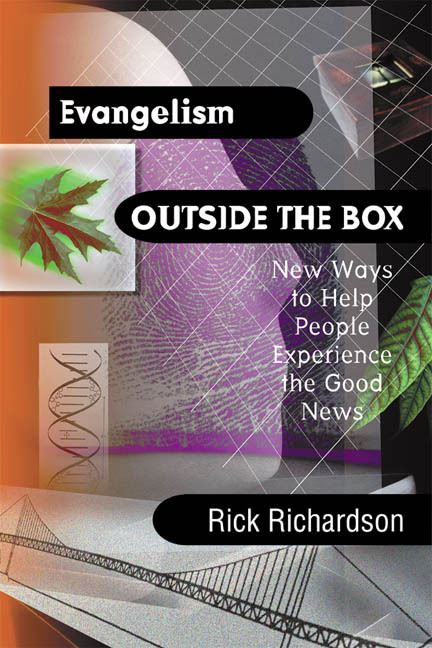 Rick Richardson takes a word (evangelism) that scares all of us and helps us to see it as something adventuresome. Reimagining Evangelism is all about building spiritual friendships, living in community and a great excursion with God's Spirit. I love the challenge Rick gives us to help people find their way back to God." "All too often the church and the small group become the 'bushel' talked about in the kids song--'This Little Light of Mine.' More than a strategy, Reimagining Evangelism is a powerful way of life that allows everyone to be involved in sharing the love of Christ with others even if they don't have the 'gift' of evangelism. Rick challenges us to take our faith to the streets, discover stories, develop deep relationships and even have fun together with other Christ followers and with seekers. An assimilation tactic that allows seekers to 'belong before they believe.'" 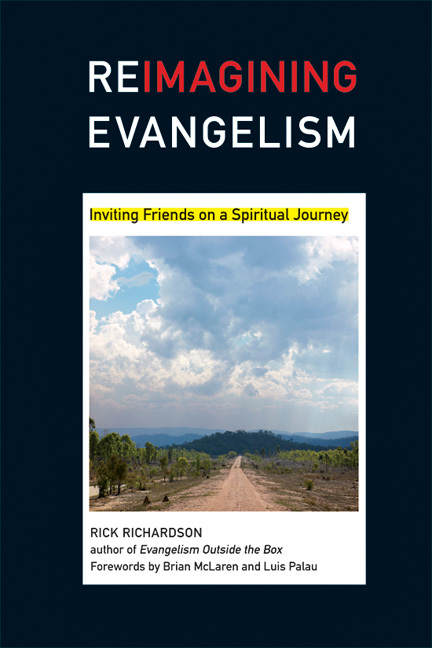 "In Reimagining Evangelism Rick Richardson has refreshed our understanding of Christ's Great Commission. Trust is the issue--only a trusted friend can enter the inner life of post-Christian people. There is no instant intimacy or trust, for it only emerges over time on a common journey. That is why conversion is a journey, not simply a jump. 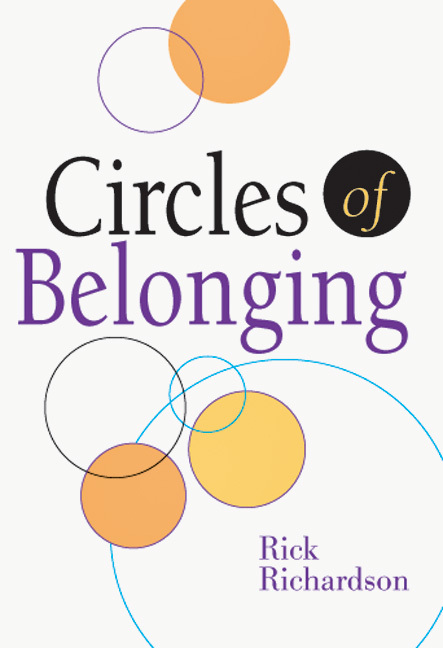 Rick clearly shows how a journey with a Christian companion of honesty, vulnerability and integrity can open a heart betrayed by the experience of religious flummery. Christians and non-Christians alike have been 'turned off' by quick-fix and manipulative methodologies. Rick has done a great service to the kingdom by expressing these important truths in an especially helpful way for our post-Christian, postmodern time." "Does your evangelism lack vitality? Do you get turned off by the sales approach to evangelism? Do you struggle experiencing the Good News as good news? "Rick Richardson replaces the old sales image of evangelism with the new images of travel guide, detective, collaborator, listener, storyteller and matchmaker. All these images are more compelling and motivating than selling Jesus to non-Christians! "Rick's thought-provoking presentation of the gospel message gives a fresh vision of God's awesome love and desire to transform the whole world. It's a Big Story that you will want to share with your friends. "Reimagining Evangelism will change your evangelism paradigm, and renew your passion for joining the adventure of inviting friends on a spiritual journey." 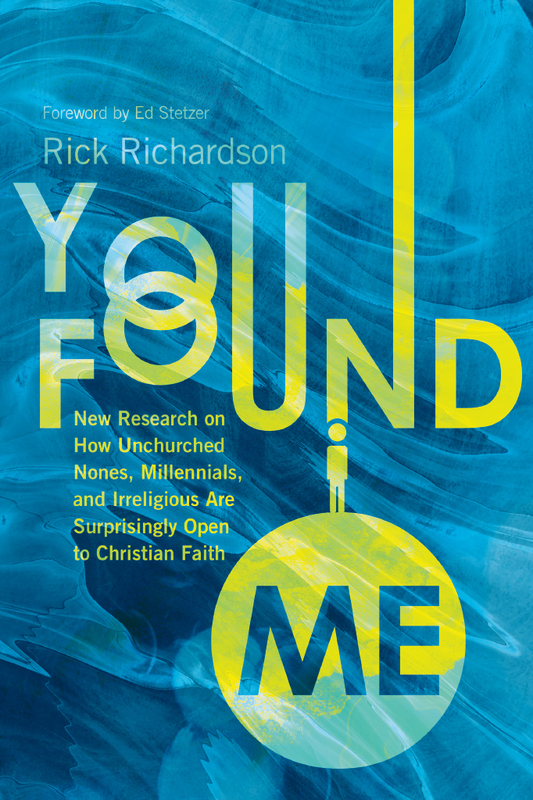 "Rick Richardson has done an outstanding job of weaving together the tapestry of contemporary culture with the mandate to bring the good news in its timeless truth. He does a phenomenal job of updating evangelistic methods for today--avoiding the irrelevance of the '70s techniques and the pitfalls that many 'postmoderns' easily fall into. Before you are done with this book, Rick will turn you from a 'gospel salesman' into a welcoming 'tour guide.'" "I loved this book. It's so warm, inviting and full of stories I can relate to. Reimagining Evangelism teaches and models how to share your faith in a way you will like--and so will your friends." "This book is fresh, provocative and insightful. If you've been running from the 'E-word,' let Richardson give you a new vision for what evangelism can look like in your life, and in this culture. You'll be surprised--and motivated! 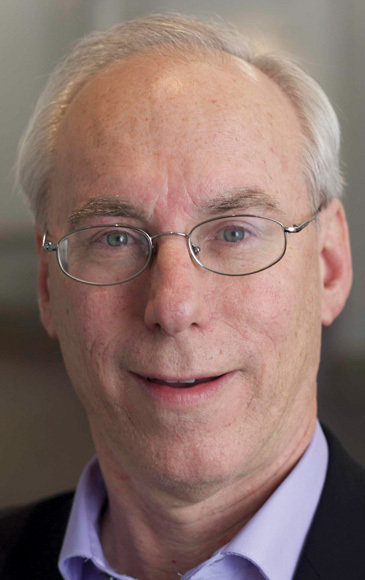 Rick is a source of teaching you can trust; grounded in orthodoxy, but proven in experience." 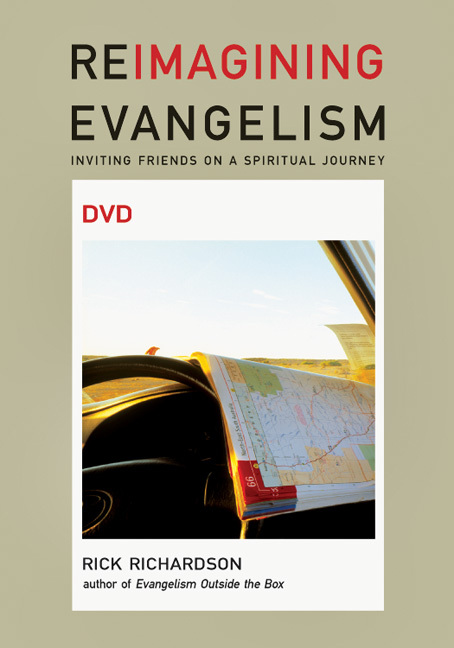 "I love Rick Richardson's view of evangelism as a journey with people who are moving toward God. It breaks the old perspective of evangelism as only getting people to cross the conversion line. How freeing! And imagine when that idea is coupled with the reality that it takes a community to save a soul. Lights will go on for many with this important book." "Rick Richardson loves evangelism but hates clichés. Many believers (and unbelievers) have come to think of those two words as being inextricably linked. But Richardson is not about to surrender the spiritual practice of soul care for the people Jesus misses most to a religious marketing machine gone bad. In Reimagining Evangelism he introduces us to postmodern cultural realities and challenges us to see the big story of Jesus. A must-read for people who are done with programs but need a new paradigm to help them navigate the cultural twists and turns they find themselves swimming in." Jim Henderson, frontman for Off the Map, and author of a.k.a. "Lost"
"This book gives language to the emerging forms of evangelism we see surfacing in many places--from a revised understanding of our role as Christ's ambassadors to the roles of friendship, community, narrative and invitation in helping people discover new life. 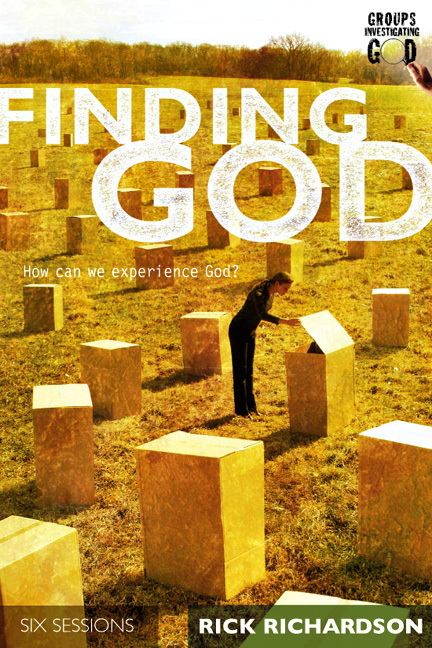 Readers will experience Reimagining Evangelism as a breath of 'cosmic fresh air'!" 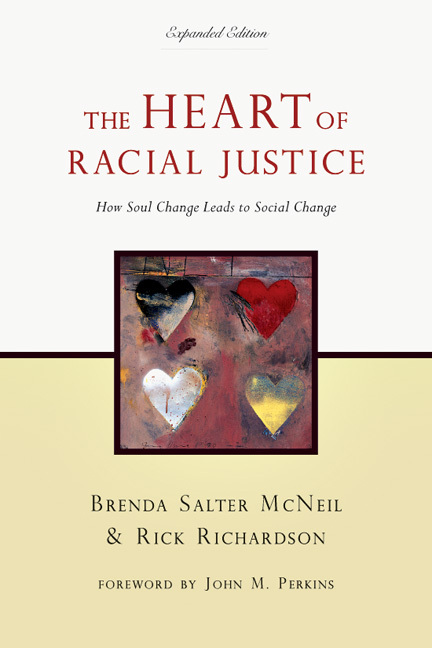 "Richardson's book is a breath of fresh air." Richardson's book offers fresh thinking and practice on faith-sharing. Richardson, with his up-to-date cultural analysis, solid biblical exegesis and global perspectives from non-Western believers, has woven a tapestry of witness that is both joyful and compelling. 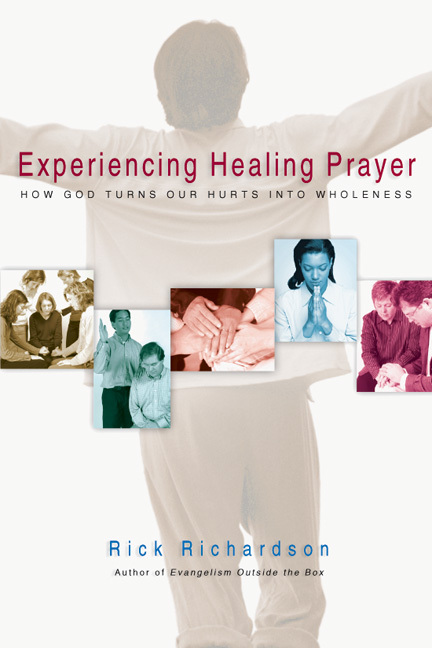 "A well-written, easy-to-read, evangelical perspective on sharing your faith. . . . It should prove to be a positive contribution to the expanding corpus of literature on this topic. I'd recommend it to both youth workers and mature students who are in need of a concise, accessible framework for sharing their faith." 1. Re-imagining Evangelism: Salespeople or Travel Guides?